It's that time again. One of my favorite bands has released another album, and it's time for me to snot and slobber on and on about how great it is. Enter antithetic sentence here - wait, no. I was being completely genuine. I am about to snot and slobber over how great Bayside's fifth major album, Killing Time, is. It's sick, sick, sick. Anthony Raneri's viciously self-aware lyrics have absolutely never failed to create the sharpest possible framework for each song, each album, each live performance. The combination of guitar sounds between Nick, Jack, and Anthony make sure that no matter how complicated the issue these lyrics skillfully dissect, the track will still melt your face. And then there is the skinny little fireball drummer, Chris, who picked up after the devastating death of the band's previous drummer and lead them right through multiple successful albums. Watching him live is inspiring. 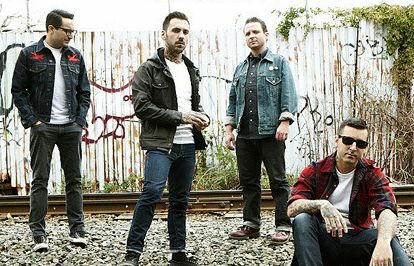 Whether it is in a club setting, a dive bar, or a huge outdoor stage - the Bayside live show is amazing and not to be missed. Record store acoustic performances ain't terrible either. It may be a lot of emo/punk/uncategorized kids who are into this band, but this can't possibly be a bad thing. Let's hope some of Ant's expert wordsmithery makes it into their vocabs sometime soon. But can a person make a difference if he never makes a sound? So buy Killing Time, and buy it for your friends too. I mean buy it. And buy a ticket to their show. I promise you, one will come nearby. These guys tour like a... rock band. And I don't ask for much, but this could define a lifetime.